The 33 DVI gas fireplace insert accommodates an economical lifestyle by offering a high quality, value-priced insert that showcases a gorgeous fire and produces excellent heat for warming larger homes and living spaces. 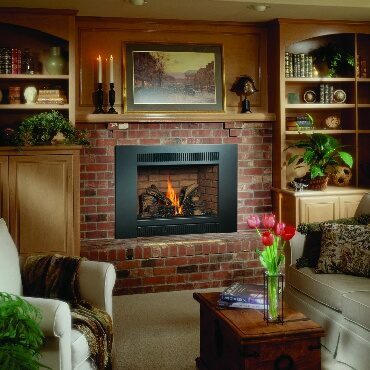 This gas insert is also great for zonal heating purposes when warming a specific area of your home is desired. A large viewing area showcases a beautiful display of fire that can be designed to complement any style. The 33 DVI also includes convection fans that help heat up your room quickly and circulate the heat to other areas of your home. Simple, manual operation and basic performance controls make the 33 DVI an easy, carefree gas insert to own. With this model, you have the choice of the optional Basic Remote Control, Wall Thermostat or Wall Timer.